As expected, the LG Optimus 2X is finally available in the States courtesy of T-Mobile, who is dubbing it the T-Mobile G2x. At $250 less a $50 mail-in-rebate, the phone is largely in-line with the pricing for other flagship devices, and with all that horsepower inside, seems fairly reasonable. You may remember that prior reviews found the hardware to be excellent but found some shortcomings in the software; hopefully LG and T-Mobile have managed to make some improvements on that front in the past two months. In what's sure to be a hit with hardware nerds, AnandTech has run a suite of benchmarks on 27 different devices. The line-up is dominated by Android, but also includes the iPhone 3GS (both on 4.1 and 4.2.1), iPhone 4, iPad, Blackberry Torch, and the WP7-powered HTC Surround. The results? Broadly speaking, Android comes out looking damn good. As for the dual cores - well, as you'd expect, they performed even better. Greek site Techblog managed to land an Optimus 2X, and took the chance to run Quadrant on the device - and damn, does the "binuclear [thanks, Google translate] NVIDIA Tegra 2 processor clocked at 1 GHz" ever manage to impress. 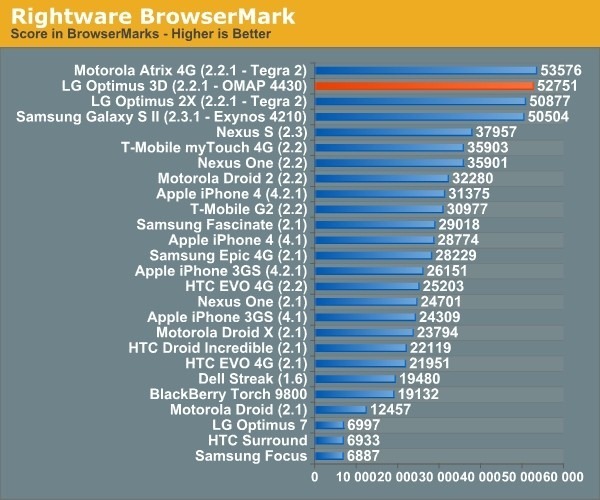 It looks like the 2X is every bit the little monster we expect it to be: not only does it have a super-speedy browser, but it managed a 2,391 in Quadrant.